Today the defeat of the Demon Prince began. Today we passed 4 million Lindens raised. Today we saw incredible generosity, and the heaviest Sheriff’s presence in Fairelands history.Today we made history. Tomorrow…? Yesterday, we were at peace with the world. Magnificat, elegant and serene, soothed away our weariness. Even the lag seemed to diminish. Today we face something rather different. 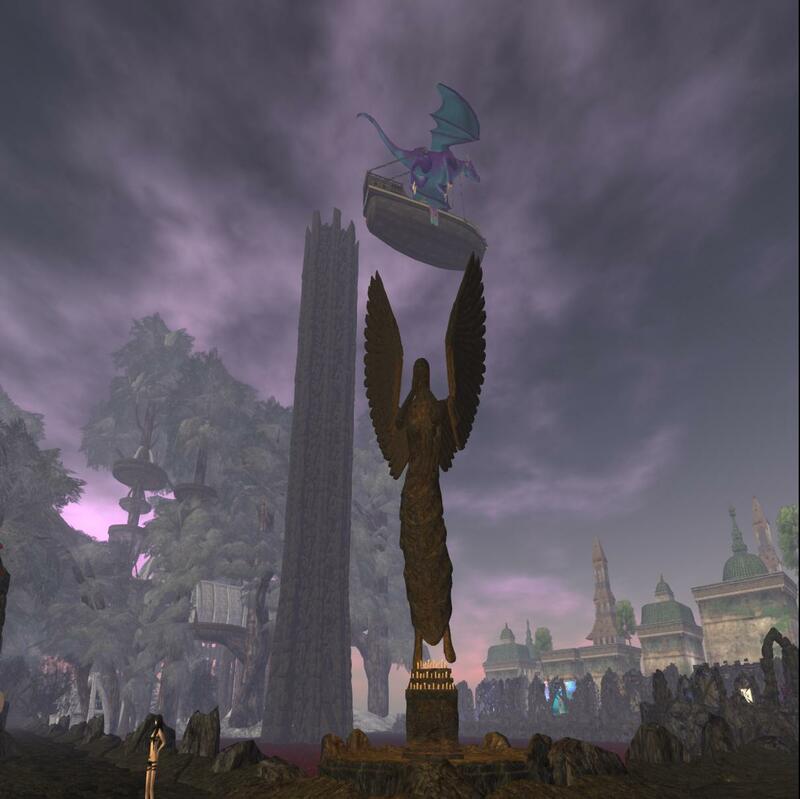 Laufey Markstein, owner of Trident, and creator of Crimson Fields built an epic viking landscape for last year’s Faire, his first as a sim sponsor. This year he has taken on a rather different challenge but one which seems to suit him well. 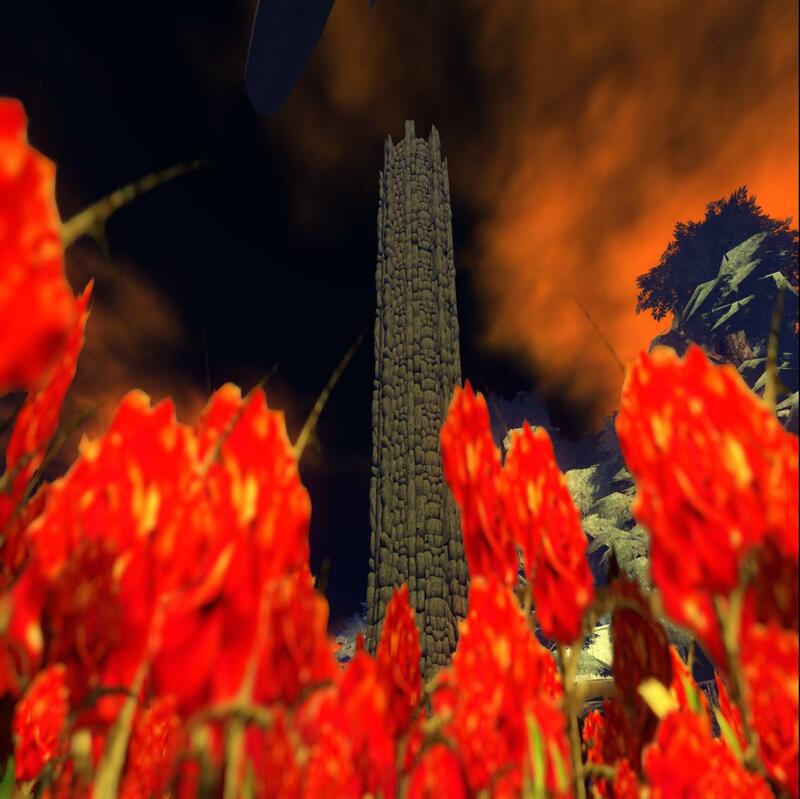 Crimson Fields, “The field of Oblivion” is built as a homage to Stephen King’s “Dark Tower” series. On entry the skies shift to a flat low light, a vast sea of red sways before you, fringed by brown rock walls and crumbling ruins. 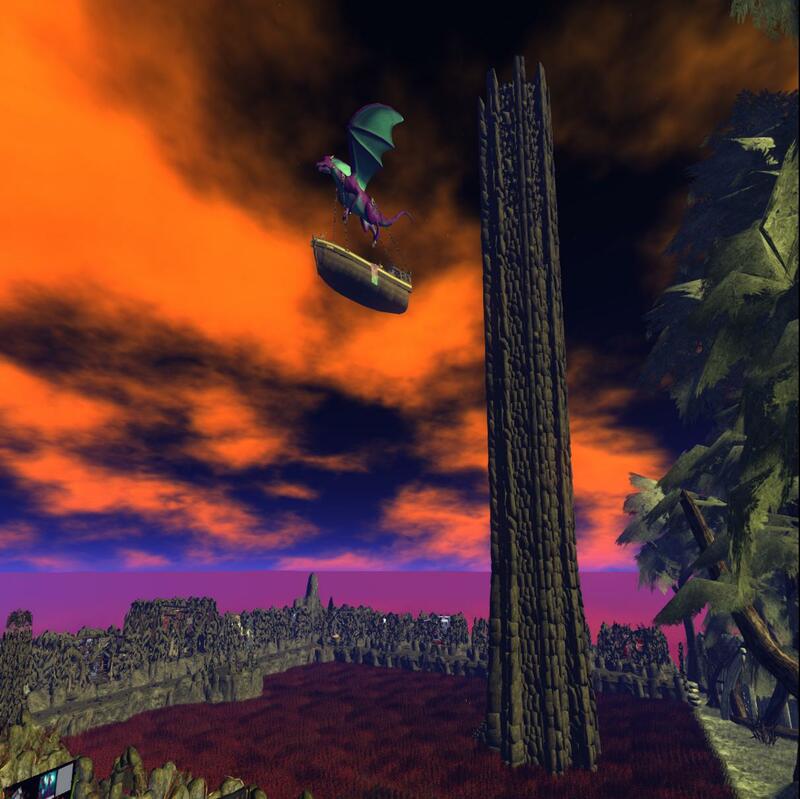 But the eye is drawn skywards, as you resolve upon the monstrous central feature of the sim an ominous, dark, gothic tower. Standing at the edge of the walls the sea of red becomes clear, no sea at all but a vast open field of overgrown thorns and scarlet red roses. We look back with fondness to the calm security of Magnificat, but we must go on, many delights await us beyond this trial. What can one do when faced with such disturbingly dark scenes? Shop, of course! Each of the ruined, crumbling buildings that line the parapet walls is a store containing the wares of one of the wonderful Fantasy Faire merchants. But be warned, many of the merchants have been associated with this sim for a reason. 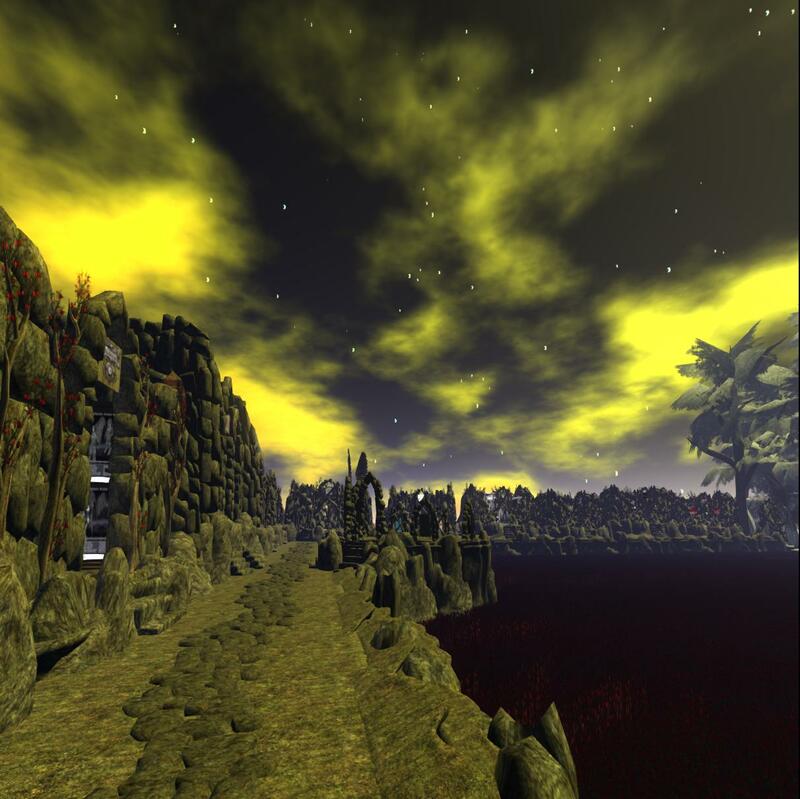 If you love demons, Gothic horror then this is undoubtedly the region for you. But even if those do not light your fire be sure to poke around in the ruins for some wonderful gems to suit lovers of other genres too. Take a moment to observe the sim from different angles, notice how with comparatively few visual features, Laufey has managed to embody the ominous, dark nature of his theme, the barren, decrepit ruins speak of a time before now. If the dark, foreboding of Crimson Fields has unsettled you then step quickly over the border with us, for our next stop is the peaceful quiet of Evensong Woods. Next Post: Have you seen these Fugitives at the Fantasy Faire?